"Fini La Guerre," shouted the Frenchmen as the marines went into action at Belleau Wood, May 30, 1918. The French lines had crumbled. The Germans were pouring through. The French thought that the war was finished then and there; that nothing could stop the victorious German drive on Paris. "Fini La Guerre," shouted the Americans in the trenches on November 11 when the armistice became effective. "Fini La Guerre"the war is finished"the war to end all wars" was finished. But was it finished? Let us see. A new type of man had arisen in Russia; a human being to whom all of the old familiar wordsGod, home, family, wealth, freedom, as we understand these words, had lost their significance; a human being whose body and mind has one great purpose: to create a world revolution; "to make the world safe for communism." But the communist, with his new code of conduct and his desire for world revolution, was not then worrying the average soldier. There were many serious national problems requiring his attention. His main thought was, "Let the Russian live his life and run his government as he wishes. I will not disturb him and he must not interfere with me." Furthermore, the American soldier thought that with the war over and the warring countries back at peace in the family of nations, this new government, based on ideas which ran counter to the main tenets of Western civilization, would soon change its principles or lose its power. But Karl Marx had declared that no single nation could hope to establish a permanent Communist State because it would sooner or later be attacked by its neighbors. Communists, therefore, both inside and outside of Russia advocate, and believe in, the necessity of world revolution as a cardinal article of their faith. Convinced that they can not stand alone, they seek to inflame the world with civil war. They constantly appeal to the industrial workers of other nations to overthrow their governments and establish a Communist Statea Dictatorship of the Proletariat. They are not content to let even the United States alone, but seek to overthrow our government and our ideals of democracy. The war to end war did not accomplish its purpose. Twenty tumultuous years of seething political strife, turbulent social changes, primitive hate and beastly terror have followed in its wake, while restless and weary humanity has struggled for peace and contentment, for life itself in the chaos of a disillusioned world. 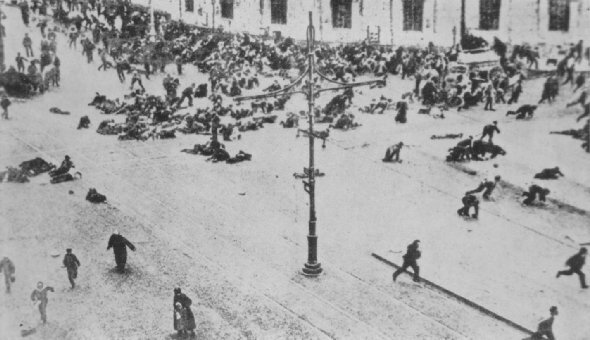 Bolsheviks beginning their reign of terror as machine guns mowed down men, women and children in the streets of Petrograd (Leningrad). Note mother in foreground shielding her child.